Both doctors are now available for appointments!! D r. Walshe, our bilingual doctor, was born and raised in Miami, but is excited to now call Tampa Bay her home. After completing her three year residency at the highly sought after South Miami Hospital, part of the Baptist Health group in Miami, Dr. Walshe decided to make the move to the west coast of Florida in order to join Total Foot and Ankle of Tampa Bay. After seeing the care and compassion the practice has for its patients, she knew it was the perfect fit for her. During her surgical residency in South Florida, Dr. Walshe had the opportunity to be trained in a variety of podiatric procedures in areas including trauma and reconstructive surgeries, elective cases, wound care and diabetic limb salvage. Her residency training also allowed her to participate in the Yucatan Crippled Children's project (YCCP), a program sponsored by Barry University and other participating podiatric residency programs, in Merida, Mexico. At the YCCP Dr. Walshe was exposed to a variety of uncommon children's lower extremity deformities, truly invaluable experiences. Dr. Walshe has a keen interest in diabetic foot care, and believes it takes a team effort by both patient and physician, to keep patients' feet healthy. Dr. Walshe earned her Bachelor of Science in Biology from Florida State University (Go Noles! ), after which she attended Barry University's School of Podiatric Medicine and Surgery in Miami Shores. Dr. Walshe is engaged to David, and enjoys dining out, spending time with family and friends, and spoiling her Chihuahua Sofie Elizabeth. In her free time she loves traveling, horseback riding and watching college football. She looks forward to attending some Bucs games once football season rolls around. Dr. Harris Kaplan is the newest member of our team of comprehensive foot and ankle surgeons. Harris followed in his father's footsteps as the second member of his family to become a Podiatric Physician. He was born and raised in New York, just outside of NYC. Dr. Kaplan attended West Chester University in Pennsylvania for his undergraduate studies. Coincidentally, many of his closest friends from college now reside in the Tampa Bay area. Following his undergraduate studies, Dr. Kaplan attended medical school in Manhattan at New York College of Podiatric Medicine. After graduating in 2011, he then went on to do a three year surgical residency at Montefiore Medical Center in the Bronx, New York. Dr. Kaplan was extensively trained in reconstructive foot and ankle surgery as well as wound care and a variety of other podiatric procedures. During his time there, Dr. Kaplan performed and authored research on a strategic modification to the surgical correction of hallux abducto valgus, otherwise known as a bunion. Following that, Dr. Kaplan served on staff for one year at Riverview Hospital in Red Bank, New Jersey where he was an integral part of a multidisciplinary podiatric practice. He now brings his surgical skills to Total Foot and Ankle of Tampa Bay as well as his enthusiasm about making Tampa his permanent home. Above all things in his career, Dr. Kaplan takes pride in building lasting relationships with his patients and in educating them on the prevention of foot ailments. He is a strong believer that his excellent communication and bed-side manner are the keys to his success thus far. Dr. Kaplan loves being active as he enjoys exercising regularly at the gym and a variety of outdoor activities. During his free time, you can find him on the beach playing volleyball or learning how to paddle board. He also enjoys basketball and softball league competition. Dr. Kaplan is very excited to become a true Floridian and welcomes the warm weather without any regrets of leaving those northeast winters behind. Total Foot and Ankle of Tampa Bay! The name "Powersteps" is likely recognized by many of our patients for the excellent support and pain relief they provide to them. We, at Total Foot and Ankle, having been recommending and providing Powersteps over-the-counter orthotics to many of our adult patients for years. Now they are available for your children too! PowerKids give our little patients the additional arch support and cushioning they need. They come in sizes from toddler size 8 to a youth size 4 and we have it available for you in our office! PowerKids, just like Powersteps, can be purchased at our office without an appointment with the doctor. If you have any questions or concerns about your children's feet, their arches, their toes, their gait or anything- take the time to bring them in for an evaluation. We want your children to have happy and healthy feet and the best 2015! Foot blisters are fluid filled skin lesion that are typically caused by high amounts of friction. The top layer of skin (epidermis) and the deeper layer (dermis) separate due to the clear fluid that is produced between the two skin layers. Foot blisters can range in size and can be painful. What are the typical causes of foot blisters? Foot blisters are often formed when high amounts of friction are created against the skin. Sports such as running, ice skating, skiing, and many other activities can lead to blisters due to the regular/repetitive motions occurring during the activity. Long distance running can cause blisters very easily since the friction to the skin is consistent with every repeated step. 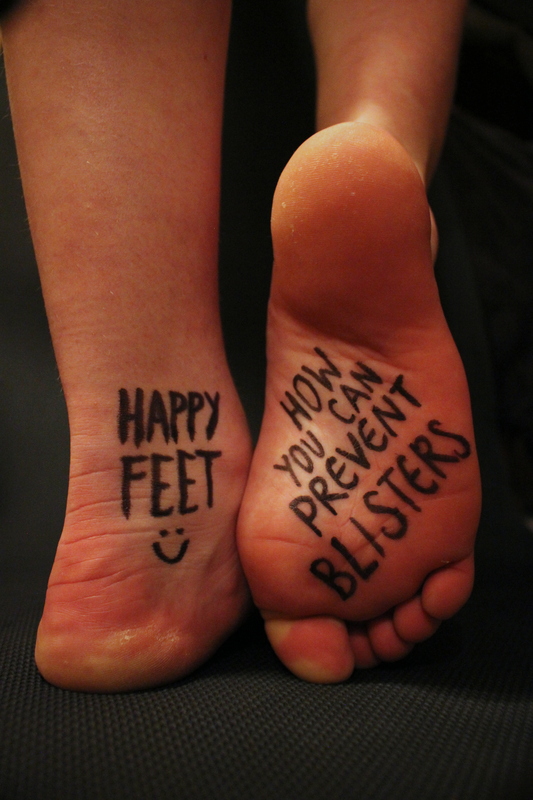 Blisters can also be caused by infection, fractures, burns, and allergic reactions. Tinea pedis (athlete's foot) can form blisters on the feet as well. The blisters are typically itchy but can also be painful. The body produces an inflammatory response to the fungal infection and the blisters are a result of that. How do you treat foot blisters? The treatment for friction blisters is quite simple. First the foot would be prepped with a sterile solution to minimize risk of infection. Then, the doctor will simply lance the blister at the base of the lesion with a small scalpel. It is important that the blister roof be kept intact in order to have a protective layer of skin. If you remove the roof of the blister you will then have a greater chance of infection and complications. The doctor will then place a non-adherent dressing to the area and then wrap with sterile gauze. Triple antibiotic may be used sparingly to help prevent infection to the skin. New skin will form underneath the blister and the fluid will be absorbed. Antibiotics may be prescribed if their is an underlying infection. If the blisters are caused by a fungal infection (athlete's foot) then the treatment is a topical anti fungal agent. The doctor will prescribe a prescription strength topical agent which should be used for at least two weeks. If the blisters are painful then the doctor will lance the blisters in the same fashion as stated above. How do you prevent foot blisters? For friction type blisters the simplest answer is to wear proper fitting shoes. If the shoes are too big or too tight this increases your risk of high friction areas. The shoe should be snug and the foot should not move excessively around in the shoe. If you have lumps and bumps on your foot such as hammertoes and bunions, then it would be beneficial to pad those areas. Special gel pads that we carry at the office work exceptionally well in preventing friction on prominent areas of the foot. Orthotics also help to even out the pressure along the foot and therefore can help to prevent pressure and friction. Wearing socks is also a great way to reduce friction to the skin. Another simple technique is to place bandaids over known areas of friction to the foot. The bandaids will act as a barrier thereby reducing friction to the skin. Keeping your feet clean, dry, and intact is the easiest way to prevent any infection to the feet. Regular inspections of your feet are necessary in order to catch problems sooner than later. If you notice anything unusual or are experiencing any pain in your feet or ankles, please call us at Total Foot and Ankle immediately. We are here to take care of you and to help you get back on your feet right away! We aim for same day appointments !! In a medium bowl, whisk together all marinade ingredients. Place the chicken tenderloins in a large plastic storage bag. Pour marinade over tenderloins and coat well. Seal bag and refrigerate 1 hour or overnight. Spray grill with cooking spray and preheat to medium-high. Place chicken tenderloins on grill and brush with any remaining marinade. Grill about 4-5 minutes per side or until done. Brush zucchini with olive oil. Grill 3-5 minutes per side. Serve chicken tenderloins with zucchini rounds.